The Manuscript Archives include paper items created by businesses or individuals. Some collections contain documents of a personal nature and some were generated from a specific business or industry. The types of items are letters, diaries, and scrapbooks, personal memoirs, biographies, business records and ledgers, research for books and articles, drafts of books and articles. Ephemera such as advertisements, brochures for events or organizations and travel memorabilia are also found. Oversize collections include architectural renderings and plans, maps, posters, and certificates. The archives contain more than 2,500 collections ranging in size from one item to seventy-five boxes or more. Spanning more than one thousand linear feet of shelf space, the collection contains nearly one million pages. 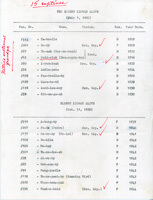 More information and a complete listing of collections can be found in the archives section of the online catalog. For help searching the catalog, see the Search Guide (PDF). Use the guides below to explore collections by topic. All guides are in PDF format. The holdings of the Manuscript Archives are non-circulating and must be viewed in the Research Center. Finding aids for manuscript materials are available by searching our online catalog. Manuscript materials can be requested in the Research Center for viewing Tuesday to Friday, 10 a.m.–4 p.m. Requests for materials to be viewed on Saturday must be made in advance. Patrons viewing manuscript materials will need to complete a patron registration form (PDF). If you are traveling to the Oklahoma History Center for a research visit, you are encouraged to contact the manuscript archivist in advance of your trip. OHS staff will prepare materials in advance of your visit if you provide the date and time of your arrival, and the collection and box numbers of the materials you wish to view. Complete the patron registration form (PDF) to prepare for your visit. Handling manuscript items in the Research Center requires the use of cotton gloves, which are provided. No bags, purses, or computer cases are allowed in the viewing room. Lockers are available free of charge to stow your personal items. You may take a notebook or laptop into the viewing room for note-taking. No ink pens or markers are allowed; pencils are provided. Copies are $.20 per page and can be paid for with cash or credit card at the reference desk. The use of digital cameras without a flash is permitted in the Research Center and the viewing room. The use of flatbed scanners and wand scanners is prohibited. Requests for duplications can be accepted during your visit and will be made for you by OHS staff for $.25 per page. We cannot guarantee immediate duplication services; duplications may be mailed or delivered electronically within one week of your visit. Please see the visitor info page for more details. Orders for copies of records will be filled as they are received; see the orders section below. Materials from the Manuscript Archives are available for duplication either by photocopy or a digital scan. Requests for copies can be made in person, by phone or email, or on our website. The collection number, name, and box and folder numbers are required for duplication requests to be processed. Duplications can be delivered by postal mail or electronically. A general request for research can also be made for OHS staff to research our collections on your topic. Research requests are filled in the order they are received and may take up to four weeks to process. OHS staff will research your topic archives for up to two hours and submit to you a page count of materials available for duplication. The research fee includes twenty pages of duplications; additional pages are $.25 per page. All duplications are approved by you before any additional fee is incurred. Our staff will search for a maximum of three topics per request. If you know the accession number for the items you wish to have copied, please include the number in your order. Order online You may also order by mail using our printable order forms. The Manuscript Archives accept original documents such as letters or business files. Please see the OHS Collection Policy for specific details. Donations containing multiple formats such as photographs, film, or audio, are welcome as a complete donation. The Manuscript Archives does not accept duplicate copies of publications, copies of materials held by other libraries or archives, or records of people or events in other states or countries. What does the term "manuscript" mean? I thought it was for book publishing? "any text in handwriting or typescript (including printed forms completed by hand or typewriter) which may or may not be part of a collection of such texts. Examples of manuscripts are letters, diaries, ledgers, minutes, speeches, marked or corrected galley or page proofs, manuscript books, and legal papers." Defined by: Hensen, Steven L. "Archives, Personal Papers, and Manuscripts: A Cataloging Manual for Archival Repositories, Historical Societies, and Manuscript Libraries" – 2nd ed. (Society of American Archivists, 1989). I have a bunch of old letters from my parents or grandparents. They weren't famous—would the OHS still want them? Yes, the OHS archives are dedicated to preserving and sharing the history of all people in Oklahoma, not just those who were well-known. The stories of everyday life in Oklahoma, during any time period, are worth preserving. If I donate something to the archive, can my family members or I come see it later? Yes, all materials donated to the OHS are property of the State of Oklahoma and therefore are public record. There is never a fee for visiting our Research Center to view materials. If you wish to have an item on display, have it scanned and print a color copy for framing. You can also visit a framing store to discuss various options using protective glass. Ask for UV protective or museum quality glass. The holdings of the Manuscript Archives are diverse in content; collections range from personal letters sent home during wartime, legal records of land disputes following land openings, diaries of missionaries, meeting minutes and ephemera from local philanthropic or ancestral clubs, and much more. The following are only a few examples of the many valuable papers found in the unique holdings. The Federal Writers Project (FWP) began in 1935 as part of the Works Progress Administration started by Franklin D. Roosevelt. The main goal of the FWP was to create a guide to the state focusing on history, culture, and people. The Oklahoma project saw its share of controversy including accusations of communism and multiple directors. Additional projects completed by the FWP included an index for feature articles in the Daily Oklahoman, (now the Oklahoman) from 1925 to 1936, compiled information on Oklahoma musicians, and a history of African Americans in Oklahoma. The Guide to Oklahoma was published in 1942. The FWP collection consists of 90 boxes. The collection is divided into three series: administrative files, narratives and biographies, and topical files. The administrative files are comprised of correspondence, memos, proposals, and project materials. The second series features biographies and ex-slave narratives. Lastly, the topical files are brief essays on a variety of subjects. Included in the last series are proposed tour routes. 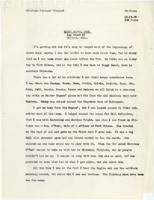 Below are some examples of the documents in the Federal Writers Project Collection. You can explore the complete inventory of the FWP Collection on the online catalog. 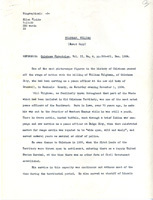 This is the first page of a biographical essay about famed Marshal Bill Tilghman. This is the beginning of an essay on the history of the Cherokees with references to The Chronicles of Oklahoma. This is an interview with Nancy Bean, who describes her childhood as a slave before the Civil War. Jerry Elliott was born in Oklahoma City in 1943. He went to work for NASA in 1966 where he worked on several projects including the space shuttle program and the International Space Station. He was awarded the Presidential Medal of Freedom by Richard M. Nixon for his duties during the Apollo 13 accident. 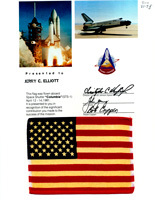 The bulk of the Jerry Elliott Collection is comprised of Elliott's NASA materials. There are materials from Apollo 11–16, Mariner 9, Gemini, and Lunar Landing Mission. Additionally, the collection includes some personal papers and America Indian publications. Here are some examples of the documents in the Jerry Elliott Collection. You can explore the complete inventory of the Elliott Collection on the online catalog. 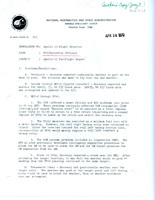 This memo pertains to the Apollo 13 flight problems and solutions, dated April 24, 1970. This page describes the events before the launch of Apollo 11, dated July 15, 1969. This certificate was presented to Jerry Elliott for his contributions to the Columbia Mission, dated April 12–14, 1981. Parker McKenzie was born in 1897 in a Kiowa camp. He spent the majority of his life working to preserve the Kiowa language and culture. McKenzie developed an alphabet for the Kiowa language and worked for thirty-nine years with the Bureau of Indian Affairs at the agency in Anadarko. The Parker McKenzie Collection contains correspondence, family materials, publications, and American Indian materials. Additionally, the collection includes Kiowa history, language cards, and elder lists. 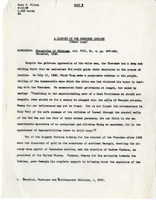 Below are some examples of the documents in the Parker McKenzie Collection. You can explore the complete inventory of the Parker McKenzie Collection on the online catalog. 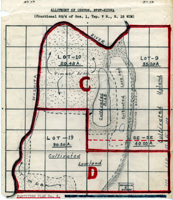 This is an example of a Kiowa allotment map. This list of Kiowa captives includes the name, age, gender, and family number. This is an example of Parker McKenzie's vocabulary cards. Included is the pronunciation, meaning, and origin of the word.